Today is the one year anniversary since the London 2012 Olympics. I’ve said how much before I enjoyed it but what I didn’t realise at the time would be how it changed sport for me and it seems I’m not the only one. In Britain, the number 1 sport is and usually was football (soccer) but the pleasure of seeing sportsmen and women training so hard and giving their all, usually for no or next to no money made me quickly remember how much I like real sport and how football was no longer such an attraction. I’m not alone, last autumn the media often mentioned how interest in football had decreased because of the Olympics effect. I’d like to say that it isn’t you football but its me. That though would be a lie. It is you football, you’ve changed and we’ve grown apart. It isn’t something that happened overnight, the sight of seeing genuine athletes competing, generally for nothing more than their pride at the Olympics may have been the straw that broke the camels back but my love of football was already in injury time by that point. There are so many things about football that have changed and most of them have been for the worst from my viewpoint. There is a almost total lack of relationship and feeling of ownership between the fans and the players and the club. When I was young, the fans and the players would often socialise outside the sport. The players were generally drawn preferably from the shadows of your smelling football grounds or if not yours at least from somewhere equally grimey. The players were well paid by normal standards but they were by no means untouchable and the clubs were often owned by local businessmen, usually inept and ineffectual but at least local. Most of all, football was played by real men. They were tough but usually fair. If someone cheated or fouled them, they would carry on playing and probably score. It was the mark of a man to be tough and many of the best British players of the day were the sort that would be genuinely tough, rather than all muscles but with the guts of Bambi, after she’d been shot. (As an aside, why do all leading action men in Hollywood films have to have muscles even when portraying historical figures. Not one WW1 or WW2 veteran I met or seen photos or videos of had muscles and they were properly tough not like the modern dweeb actors who spend more time in the gym than at stage school). Terry Butcher, leading by example. 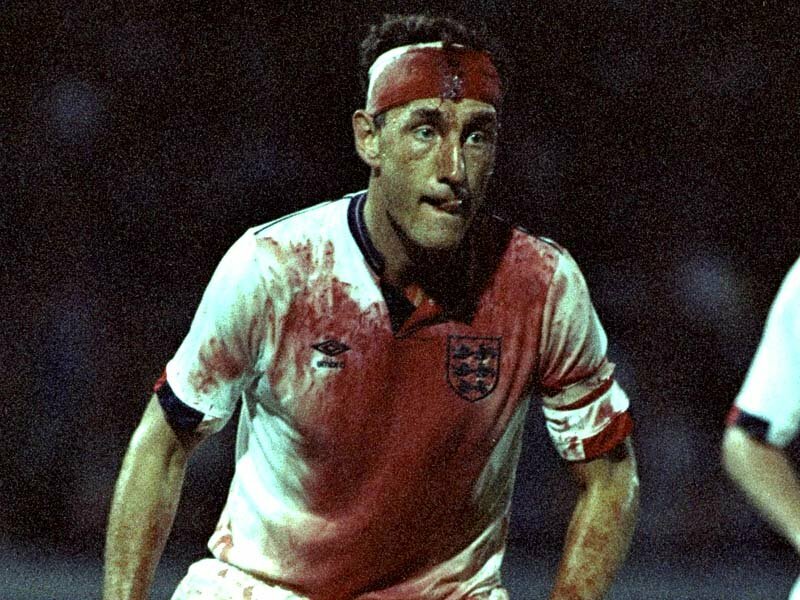 The photo above is of Terry Butcher, even his name sounds well butch. Can you imagine a modern day footballer play like this? Aside from the namby-pamby health and safety rules, most modern players would go down like a tonne of bricks and roll over twenty times. If they were hurt they go off the pitch, if not hurt at all they would miraculously get to their feet. 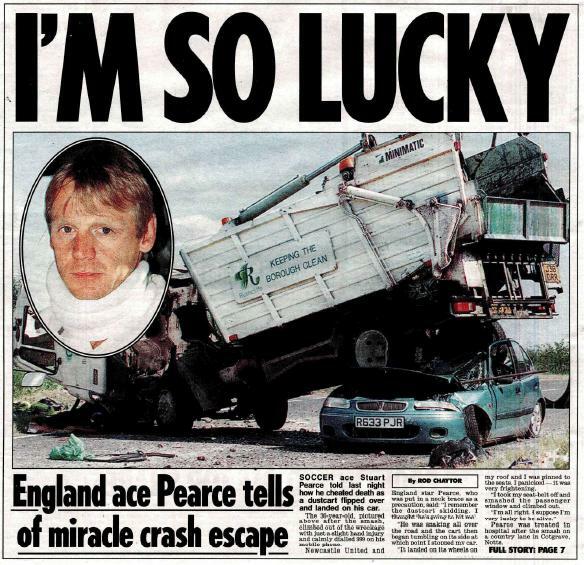 Stuart Pearce, when men were men. 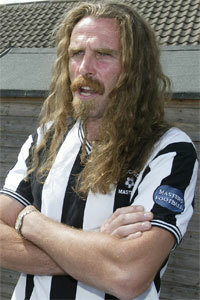 My team is Newcastle United, when I was about 18, our team was loaded with tough-guys. David Batty dished out the firm but fair tackles but would not moan when he was subjected to the same. There was also Brian ‘Killer’ Kilkline, the clue is in his name. 6’2 inches tall and built, as they say in the north of England, like a brick $hit house. Then there was club captain and one time England captain, Stuart Pearce. He sounds harmless enough until you remember he was lovingly known as Psycho, mainly because he was. On at least one occasion he played most of a match with a broken leg! My team wasn’t an exception, most teams had players who were tough and tackled hard rather than poncey and unable to tackle or receive a tackle properly. At 6’2″ tall, Brian Killer Kilkline wasn’t hard to miss and wasn’t shy on being rather than acting tough. When did it all go wrong? Probably about 25 years ago when football sold its soul to Sky Sports and entered into a never ending circle of spiralling prices for the fans. Standing was outlawed and prices for seats soared ever more steeply. What was always a working mans game watched by coalminers, steelworkers and shipbuilders with bad language and rough behaviour to match became a sport that only bankers, insurance salespeople and footballers could afford to watch live. Where bankers and insurance people are renowned for being without morals and doing anything for money, maybe that is why football turned out the way it is. Footballers began to become celebrities, and then celebrities that everyone knew full well knew nothing about football suddenly decided they had always supported a team on the other side of the country whereas normal fans got priced out of seeing their team. Football Clubs stopped valuing their fans as they got more money from television channels. They started buying players from all around the world because they were cheaper than their local players and usually better. Better at a price though, some were fantastically skilful, many weren’t. Few were committed to the team or the fans, just for their bank balance. Many of them dived. It started off as a joke when the legendary Jurgen Klinsmann scored a goal and celebrated by theatrically diving. The problem is, most of the players that followed weren’t as good and they dived at every opportunity. Soon the few British players started diving too and now we are left with a sport full of wimps. When I played football at school aged 5, my teacher would make sure the boys played no matter what and never cheated or pretended they were hurt. Anyone who even winced when they cut their leg or dislocated a shoulder would be laughed at. Now players get hit in the head by the ball and pretend a player bit them instead. They even berate the referee and encourage him to send sometimes innocent players off. Now football is all about money. Most of the teams are owned by Russian or Arab billionaires with as much a connection to footballing tradition as I have with deep-sea diving in the Pacific. The players fall down for no reason, I swear last year I once broke wind in my living room watching a game on TV and the entire Chelsea team dived to the ground. There is now a media driven pretence that we must support British teams when they play European rivals. I have never done that and never will. For a start, I hate most of the other British teams and secondly if they win, it just gives them more money, makes them more successful and makes their fans even more obnoxious. I have yet to meet a team supporter of any sport come up to say thanks for supporting their team. Normally they just insist on how brilliant they are and how your team are useless. They’d be right too of course. I’m not bothered about Manchester against Barcelona or Chelsea against Milan. I don’t know anyone from Barcelona or Milan and half the fun of football is teasing the losers. Easy when it is Newcastle Vs Sunderland, less easy when the other team are the other side of the continent. Football is much more fun now watching it in the park on a Sunday morning. Modern football in Britain isn’t just ruined but it is boring, we all know who is most likely to win and it always stays the same until a new mega-rich billionaire decides he wants to ruin another football club. I can’t even support England, not really. This isn’t because they always either have a great manager and an awful team or an awful manager and a great team but I just can’t bring myself to support players I despise who cheat and dive and swear their way through life. Patriotism shouldn’t cover cheating and bad behaviour. If a team from South America or Africa played more fairly then I would support them any day of the week, sadly their teams dive and roll more than the Rolling Stones in an Olympic diving competition. So if England is just about still the cleanest team then there is nothing left for me to watch. I’ll always support my own even under-achieving and perennially badly run club but if they aren’t on television in front of me then I don’t follow them any more. They’re owned by a multi-millionaire with no morals or sense of history and as someone who has worked in totally inept organisations, Newcastle is probably the only sporting club that matches them. It is now a year since The Olympics and I have watched all of 1.25 football matches since then. Do I miss it, absolutely not. I have if not discovered then found a renewed appreciation for sports where players share the tough but fair competitive spirit that football used to have. Rugby, full of the football players of the all round hardness of Psycho and Butcher. They play hard and fair, whatever team they are. Cricket, I always enjoyed cricket but it is now probably my favourite sport though Rugby pushes it close. Cricket isn’t quite as it was 20 years ago. The Australians have led a chipping away of the gentlemanly qualities of the sport but generally the players are fair and play sportingly, some still walk off before waiting for the Umpire to say that they’re out and aside from the odd bribe taking Pakistani player, they don’t cheat or try and mislead players or referees. I’m watching the Cricket Ashes at the moment, England Vs Australia over 30 days of toughly fought but fair sport. I can easily say I admire any of the hard-working Australians more than any English footballer I know. Snooker is another one I have always liked. The players here aren’t at all macho but then they aren’t meant to be. However they are always 100% fair and will often admit fouls that both the other player and referee failed to see. 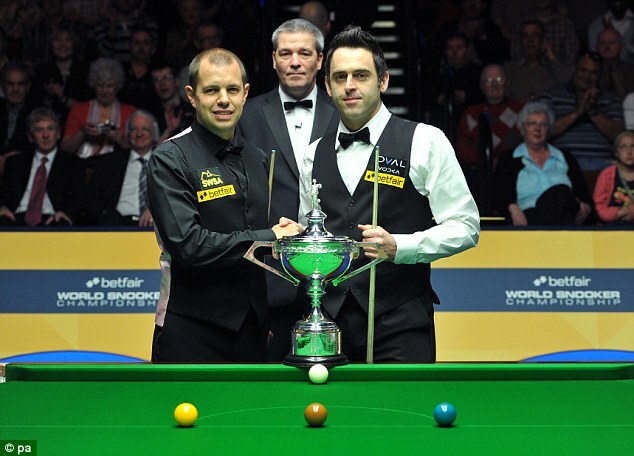 In Snooker, every game doesn’t just begin and end with a handshake but the spirit goes right through the match. All these sports still value fair-play and honest hard work for things other than just money. When it comes down to it, whether sports people cheat by taking drugs, or cheat by feigning fouls and injuries, if you can’t play fair then what’s the point. Sadly television money is in the process of partly ruining some of these sports. Cricket is only available on Sky and the ruling authorities keep modernising the game, each time getting further away from the original and usually after an initial boost of support, getting less popular too. Twenty20 cricket is awful, call me old-fashioned but a cricket match should last 5 days and those are the only ones that I watch. If you can’t watch a sport for more than a few hours because your attention span gets lower every-time a new iPhone comes out well tough luck but people managed it for two or three hundred years without problems. Cricket matches transmitted from India and Snooker matches from China also have more adverts on-screen than actual sport. Adverts round the pitch, adverts on the players sleeves, adverts printed on the pitch, sown into the carpet. They are everywhere and just about enough to make me switch off there too. Thank heavens for cricket at Lords where players play in boring white outfits or Wimbledon where you can go most of the tournament without seeing any advertising. My on football team Newcastle United under their money-grabbing and incompetent “new” owner is no better with their shirts now displaying adverts for Wonga an exploitative and extortionate pay-day loan company in one of the poorest cities in Western Europe. Even the Olympics though isn’t without fault when it comes to advertising. It surely can’t be right that junk food and alcoholic companies that make people fat and ill can be on the same track as the fittest athletes in the world. When it comes to watching Manchester Vs Chelsea with their 22 players each worth millions of pounds but with less of a backbone than a baby jelly-fish or an Egyptian weightlifter who is much worse than his rivals but who struggles on to achieve his personal best then I’ll be cheering on the weightlifter every time. It might be the simplest and greatest game ever but so long football, I’m giving you the red card. I’ll come back if and when players don’t cheat or foul or do it just for the money. You should only dive into a pool and frankly even if someone has kicked you in the head, really you should just carry on anyway. I just can’t bring myself to take an interest in players who are so much beneath me in almost every way. They might get more money and might have more muscles but whether it is falling down the stairs now or being kicked in the playground when I was 7, if I did fall down, I got straight back up. Maybe the teams should buy players from normal backgrounds. I’ve seen on the news that drunk yobs can get hit or kicked several times and they don’t roll over at all. I’ve met lots of people from Africa and Europe, some of them I have accidentally bumped with my shoulder and not one has dived to the floor holding their head. Maybe modern footballers really are just wimps. What do you think, is winning at all costs the most important or is the spirit of the game and the taking part that counts what matters most? If not football, is it the same for certain sports in your country? This entry was posted in Life, Opinion, Popular Culture and tagged Advertising, Commercials, Culture, England, Fair Play, Football, Footballers diving, Life, Newcastle United, Premier League, Soccer, Sport, television, Wonga. Bookmark the permalink. That is a shame about NZ rugby that it has gone the way of so many other sports. In the UK we all grew up thinking that Kiwi rugby was one of the ideals of hard but fair sport. It is hard to cheer on your best player when you know he will be going elsewhere for more money next season. My local team was Leeds, although I did go to see Liverpool at Anfield when I was at university. It was a derby. I tried to go and see Leeds play Huddersfield, we thought it would be pretty quiet – couldn’t even get in! I did see Leeds play Newc (!!) at Elland Rd, it was a great match. It was in the days of Keegan and football violence. Wicked. Loads of things were thrown onto the pitch and the ref had to stop the match. This was early 80s I might add. I managed another ‘derby’ when I flew to NZ and watched the All Blacks play the Kangaroos. That was good too. Must find my piccies. I did watch some of the Olympics because suddenly the BBC took off the restrictions about who could view internet TV (normally we can’t see it here in Gib), and especially enjoyed the cycling. I’ve watched TdeF when I’ve been in Spain. Oh and I have watched the World Cup from time to time (again in Spain). I used to watch Wimbledon too, but it’s hard to get excited about Murray or Nadal when your heart belonged to Nastase and Connors. That must have been great to watch the All Blacks especially in against their derby rivals. When I think of it nearly all the sports are played for better reasons than football. I didn’t get to go to any of the Newcastle-Leeds games in the heyday but I am sure they must have been lively. As I lived in London and was only a kid I would wait for Newcastle to come down here. I remember one day with a friend in Watford of all places we got cornered by a very large group of what passed as local tough guys. Realising we had made a wrong turn we turned back with them on our heels when all of a sudden the cavalry arrived in the shape of several hundred bear chested, kilt and jean wearing tattooed Geordies. You’d never seen the Watford boys disappear so quickly. I like and liked Snooker too, it was such a shame what happened to Alex Higgins, very similar to George Best and Gazza. Snooker lost many of its personalities though I lost count of how many times I cheered on Jimmy White in the finals. You’re right about Murray and Nadal, I think tennis has had that problem since Pete Sampras who always seem to bore his way to victory. Not like Connors or McEnroe . You have captured the demise of fair and tough play in sport well. Most sports have gone further and further away from the real fan. It is now more about showbiz. Of being seen at the right place. While watching a game from a business box, sipping champagne, if you can afford it, may have its charm, but it is not the charm of watching a sport. I agree. I used to love watching England play cricket in India even though most of the time India were always on top with those sold out grounds week after week. Sport should be for everyone and not watered down with players who don’t really care and rich corporate ‘fans’ who only attend to seal business deals. The same thing has happened to the National Hockey League in North America. I used to be a huge fan. In the late 80s, it became more about the money. Seat prices were affordable even for someone making minimum wage. Now I’d need a loan to see a regular season game. Many players still didn’t even wear helmets when I started watching. Players were more polite and wouldn’t hit dirty because no helmets were worn. Money, dirty hits, wimpy players, stardom and retarded commercials have ruined hockey. I haven’t watched a game in more than a decade. I still play when given the opportunity, but I don’t even watch the little kids play anymore. The attitudes of the players (and many of the parents) are horrible. Very rude. I’m from Cole Harbour, NS, home of Sydney Crosby. Hockey really became a ‘big deal’ with many kids being pushed to succeed after he became successful. Many times I’d stare at the parents instead of the kids. They were idiots for the things they’d say. It’s such a shame. Hockey is such a great sport and when the parents start teaching or shouting at their kids to emulate the professionals then you know it is a lost cause. It is very much the same here with football. Why can’t the children be left alone to have fun when they play. They might even enjoy it get good coaching when they are older..
You know how things fall out of fashion every now and then, I think that might happen to lots of sport in the next 50 years because of the commercials, big money and wimpy attitude of the players so that in the end no one will watch and the only people who play it will be those who love the sport, like it was when it started. Whilst we here at FootballDons love, write, discuss, debate and speculate about Football as a whole, we have to say your article is poignant, and by no means wrong. Myself, I am a Birmingham City fan. To be a fan of a club such as that you have to know what the real grittiness of sport is like. We’ve felt pain more than success, and have only ever wanted our team to stand up and be counted. The Premier League is now not so much of the same mentality. Although I would watch whatever game was televised and enjoy watching the pace, technique and class of players from all over the world, it is not what it used to be. I play football and was a centre back. For this reason I enjoy the Terry Butcher’s of this world and I have to say there are still some of those centre backs around playing today. John Terry, Michael Dawson, Pablo Zabaleta, Phil Jones will all defend until they can’t stand no more. Whilst it is true that football has been watered down due to it’s investment, televised games, foreign takeovers, it is the growth of Media in the last 25 years that is now able to depict every small minor negative detail out of football and make it into a story. I would guarantee the same types of scandals and stories were happening years and years ago, difference was they were never exposed. So, whilst I read this article and hear its familiarities from when I talk to my Dad about football, I have not yet lost my love. My love is still their, it has just had to develop and evolve as the beautiful game has. This is also not to mention that I also loved and watched every minute of the Olympics that I could. I am absolutely with you on watching sport that involves fair competitive individuals in team that only want to give their all. Thanks for your really great and eloquent comment Luke. The media often forget about teams like Birmingham though in truth it is often to watch two teams at the middle and bottom of the table than the likely walk-over between a top 4 or 5 team and anyone else. I wonder if this is what is must feel like to Scottish fans? It’s just unbelievable how things have changed now. I wonder if many fans still try to get to or indeed can afford to visit all the grounds. As a Newcastle fan I did enjoy the Keegan era, perhaps we were the last English team to threaten to win the league and break the dominance of the top clubs without foreign money (though plenty of English money) and probably would have done if it wasn’t for a a certain match against ManU and a very talented Arsenal team in a few cup finals. If one day I manage to move away from the London area then I would certainly try and follow the local team especially if they were a small one, maybe Shrewsbury or Yeovil. The few minutes of football I watched last season involving Scottish teams and lower division English teams certainly felt more enjoyable to me than then Premier League and the the fawning obsession over 2 or 3 teams and these days even the odd manager! This has happened to me to towards the back end of the 2013/14 season. Me and my Dad much to my Wifes chargin would spend Saturday match day or sometimes the whole weekend watching the various televised fixtures. But like you I automatically supported my local side regardless of where they were in the league and if they were being televised I would always watch them over any other team first. My local side is Wigan Athletic and the last match I watched with my Dad was pathetic and in a game they should have easily won they ended up losing 2-0! In fact 20 mins into the game I actually had to keep checking myself from nodding off, it was that boring and the players just seemed as though they couldn’t be arsed and were just going through the motions so much so that I bailed out on my Dad at half time and haven’t been back to watch a football match with him since which is a shame as it was a sort of Father Son thing at weekends. I have started to watch Rugby League which is by far a more faster paced and exciting game unlike some Premiership fixtures which have the feel of a Chess match where at times I have half expected the likes of Mourinho to squeal “Bishop to Queen Knight!” from the bench. Money has ruined Football and the whole Premiership is rotten from the bottom up in my opinon of course if you was born just before the Premiership was formed or after and the term “Divison One” is alien to you then you have been brought up with what now passes for Football so will not understand what I and the author are talking about.